Boeing and NASA moved one step closer to the maiden flight of the Space Launch System after the agency-company team completed majority of outfitting efforts for the rocket’s core stage engine section. More than 500 sensors, 18 miles of cables and key systems for mounting, controlling and delivering fuel were installed on four RS-25 rocket engines, NASA said Friday. Technicians also attached cork insulation for thermal protection and painted the exterior of the section. 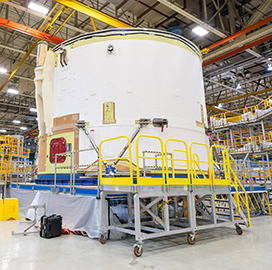 Remaining work on SLS engines at Michoud Assembly Facility in New Orleans will involve adding a boat-tail to the bottom of the structure as well as other minor outfitting, integration and avionics functional testing activities. NASA added it aims to use lessons from the first flight of SLS in efforts to accelerate the development of engines for a potential second mission. Boeing has built and applied an undercoat on the core stage engine structure for the follow-on SLS mission.